The medieval sandbox game Life is Feudal: Your Own will leave early access on November 17th has announced the developer. Up to 64 players, the title features terraforming, tunnel building, food and cooking system, unlimited alchemy combinations and more. Details, screens and a Sean Bean-narrated trailer inside. 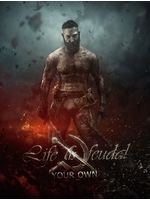 November 6, 2015 – The full release of Life is Feudal: Your Own is approaching fast. With development nearing completion, including many community-requested features, the multiplayer medieval sandbox is set to leave Steam Early Access and launch November 17th with a 40% Midweek discount. Watch our new animated trailer featuring narration by film and TV icon, Sean Bean (The Lord of the Rings, Game of Thrones) – never fear, we promise that he doesn't die. Will you play the part of a warrior, a farmer, an architect, or even an artist? Life is Feudal: Your Own presents an open world full of possibilities. Work with your community to alter the landscape and use modular building tools to erect realistic villages and cities. Craft the items needed to survive and enrich your life, and challenge other player in physics-based combat. Life is Feudal: Your Own emphasizes the community like no other sandbox game. You can survive alone, but you'll need to work with your neighbors and share your skills to be truly prosperous. Although PvP is a real threat, a clever alignment system helps to aid the righteous while ensuring that the wicked will always have the most to lose. - 64-player, 3km x 3km world in a realistic, medieval setting. - Create persistent worlds with your rules, including crafting times, skill-caps, and even permadeath. - Utilize modular building tools to create villages, cities, and fortresses. - Terraform the landscape above- and below-ground with nearly limitless freedom. - Make the character of your choosing with class-free character progression. - Hundreds of items to craft, from weapons and clothing, to buildings and decorations. - Repel the attacks of other players, or join with friends to build an army and conquer. - Physics-based combat using mouse and character movement. No lock-on targeting. Additionally, each player will also receive access to the future release of Life is Feudal: MMO, currently in development. Life is Feudal: Your Own launches November 17th on PC. I was hoping for a gameplay trailer. MP only? Shame, no interest then. Bad hipster tats, haircuts and beards.... in an old medieval setting? I like Sean Bean but god was listening to his wooden monologue in the useless trailer and the most boring behind the scenes video EVER was annoying as hell made me not want to ever hear his voice ever again, do the makers of this game actually want anybody to buy this game, if the developers are reading this please release an exiting gameplay trailer without Sean Beans voice. PS. I'm going to leave trolling about the screenshots to someone else. If this is the same game that's been in paid alpha on steam, there are plenty of game play videos out.